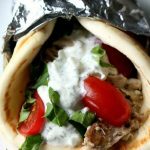 Tender, juicy seasoned chicken and onions piled onto soft pita bread and topped with a creamy cucumber yogurt sauce, tomatoes and lettuce. A perfect meal for any night of the week. Place chicken, onions, garlic, olive oil, oregano, allspice, lemon pepper, lemon juice, red wine vinegar and broth in your Instant Pot. Cover and press the manual button. Set the timer for 20 minutes. The Instant Pot will take about 10 minutes to come to pressure if your chicken is thawed and probably twice as long if your chicken is frozen. Once the timer beeps let the pressure release naturally for about 10-15 minutes and then move the valve to venting. Remove the lid. The chicken should be really tender and shreddable. Use a slotted spoon to remove the chicken from the pot and place it on a cutting board. Shred the chicken. If serving immediately you can then place chicken on the pita and top with Tzatziki and desired toppings. If serving later, place chicken back into the pot and let it marinate in the juices and keep the pressure cooker on the warm setting. When ready to serve, use a slotted spoon to remove shredded chicken. In a medium bowl, combine yogurt, cucumber, dill, salt and garlic powder. Stir until combined.